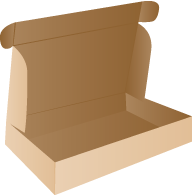 These are the most common type of carton. They are easy to erect and can be closed by taping or gluing the top and base flaps. Flaps meet in the centre top and bottom. These cartons are similar to the RSC except they have flaps on the top and base that fold right across the width, giving two full layers of board for extra strength. Creased cardboard with 5-panels that wrap around a product and are taped closed. The flaps on the end fold in, providing stacking strength and protection for long articles. 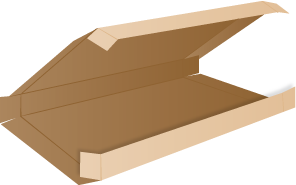 The 5 Panel Folder is particularly useful for packaging long and narrow products. 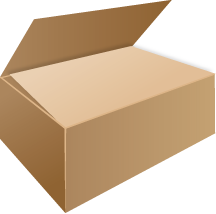 This is a self-erecting box – it needs no staples or glue. The lid folds down and the tabs tuck into the front of the box, creating a sturdy and attractive box. The larger versions of box and lid come flat packed and require gluing by the client. 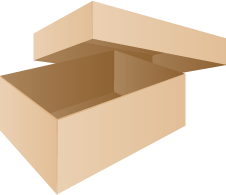 Die cut box and lids are available in smaller sizes. These are self-erecting, requiring no glue or staples. 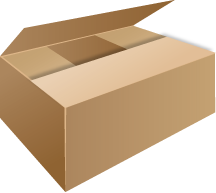 When quoting we work to the internal dimensions of the box measured in millimetres.